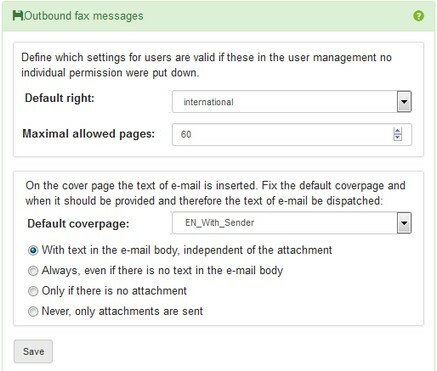 In the User Administration, a sender number can be entered for every user and permissions for the sending of messages can be assigned. If this option shall not be used or if not all the users have been configured yet, default rights can be determined here. The setting is overwritten by the individual user settings. These settings are only valid for users, whose e-mail sender addresses have been found in the LDAP-data base. Here it is entered how "far" a user is allowed to send ixi-UMS fax-messages. If the user wants to send a fax with more pages than entered here, he gets an error message. The folder selected here must contain the universally valid coverpage which is always used when the user has no other specification. The selected coverpage is used whenever no other folder is specified in the outgoing message. Always, even if there is no body ... it is generated with all faxes (also with faxes without Bodytext) a coverpage. Only if there is no attachment ... only one coverpage is generated, if bodytext is present, but no attachment. Never, only attachment is send:.. the body text never send in the fax message. If "Never .." is selected and a user sends only a body text, an error message is generated.